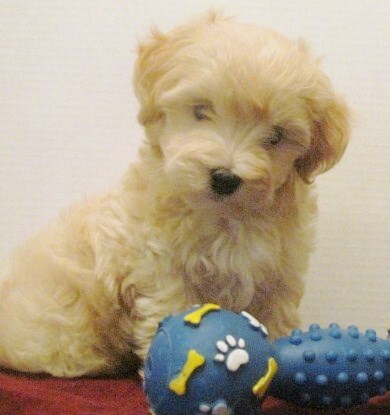 Malti-Poo puppies are full of energy, curiosity and oh, so playful! Also known as Malt-A-Poo, Malt A Poo, Maltipoo, Maltepoo, depending on which registry you use, these little guys make great pets for singles, families and people of all ages. Their size is determined by the parents. Most Maltese weight between 4 and 7 pounds according to the standard and a toy poodle’s ideal weight is between 6 and 10 pounds, although the standard only specifies height requirements. Some teacup toy poodles are even smaller, making the Malti-poo puppy very small. Due to their small size, these dogs do great in small areas such as apartments or small condos. The puppies weight and size can fall somewhere between both parents. This is considered a hybrid or mix between a Maltese and a Poodle. Unless the poodle is white, you are unlikely to get puppies that are pure white as the one in this video. These dogs are generally very fluffy, have either curly or wavy hair and shed little to none. They are an ideal solution for anyone with allergies because both poodles and maltese rarely shed and are mostly hypoallergenic. They are extremely playful and will keep you entertained for hours. Except for the very smallest Malti-poo, they generally do very well with children. Supervision is always encouraged when dealing with young children and puppies. To obtain more information about this hybrid, please visit our sister site to read the article devoted to Malti-Poo dogs and see if this type of dog is right for you and your family. We are always in the process of thinking about, filming, or editing new videos both informational and those that are just for fun. If you would like to see one on a particular Shih Tzu related topic, please complete the form below to make your recommendations. If you like what you see, consider subscribing to our You Tube Channel so that you will be notified each time a new video is uploaded. As a way to off-set the costs of keeping this website going, we often recommend products that we think you might like. If you love Malti-Poos, you'll love what you see below. The following items can be purchased from Amazon by clicking on the pictures below. Our site gets a very small commission for each product you purchase from Amazon when you click directly from this site.